I’m mid-chew staring at the Sephora store across the wide, marble-and-glass expanse of the Time Warner Center when it struck me: I skipped dessert (at lunch) for this? I had just been herded through a roped-off line to buy four macarons from a brightly-lit display case of pastries branded with Thomas Keller’s name. I have stopped by Bouchon Bakery (walk-up counter, not the mini-dining area beneath the Samsung sign) many times, but had only bothered to eat there once before. Last September, my sister and I shared a “Pesto Croissant” for breakfast. It was fine. It was certainly not as disappointing as the macaron that now glued my mouth shut with gummy meringue and sticky ganache. Or, was it ganache? I don’t know. I just swallowed it and shoved the macaron aside for my friends to try. All four flavors were passed around. The verdict was uniformly the same: they were bad. Well, maybe not all bad. The “macaron of the day” was actually very good. But, some objected to the Bananas Foster flavor. I liked it. The nut meringue was crumbly, loose and somewhat moist, perfect, really. The flavor wasn’t bad either. It was buttery and laced with rummy goodness, not to mention it was separate and distinct from the meringue. But, batting 1 for 4 is not a great record. It certainly isn’t a TKO. 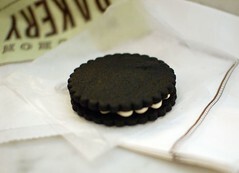 Speaking of, my friend got one of those, too – Thomas Keller’s Oreo. It’s ginormous, the size alone would totally knock you out. And, so would the size of many of the pastries at Bouchon Bakery, many of which were surprisingly large. The pastry cream-filled donut heavily coated with (what looked like) butterscotch looked like a product of a state fair. It could feed a hungry family of four. 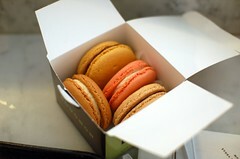 Likewise, the macarons in the display case at Bouchon Bakery are what I call the “super-sized” ones. They’re the size of the larger macarons at La Maison du Chocolat (and elsewhere); the ones that seem garishly out of place among the dainty French pastries and bon bons. The ones that seem to exist for the Americans (although I know the larger ones also exist in Paris). If you want the “small” (read “normal” in French) macarons at Bouchon Bakery, you have to buy them in the pre-packaged boxes (I believe they come five to a box). But, for some strange reason they’re dipped in chocolate. Why would they do that? This isn’t the Thomas Keller I thought I knew. That Thomas Keller is supposed to be “all about finesse.” This Thomas Keller was clumsy and inelegant. This was all especially disheartening given that I had just had (another) fantastic experience with the macarons at La Maison du Chocolat the day before. Not only do they make some of my favorite chocolates (Othello, Cannelle, Bacchus, and the Champagne truffles, especially), but they have the best macarons I’ve had in New York City. Breezing through the other uninteresting pastries at Bouchon Bakery that we tried, there was a sickeningly sweet Turtle Tart. It was thick, rich, dense, and could have rotted the teeth out of an elephant. The fact that there were a few crunchy salt crystals embedded in the caramel did nothing to deepen the one-dimensionally and cloying saccherine profile. It was also immensely difficult to cut with a plastic knife. The (plain sugar-dusted) doughtnut was a little better, if not a tad dry. My friends and I all made the same observation of the dough. It wasn’t as soft or pillowy as a yeast doughnut. Yet, it wasn’t crumbly like a cake doughnut either. I (quickly) pointed out that it was like (or, maybe was) brioche, something which I do not care for. Other than being dry, the doughnut was not per se bad. It certainly wasn’t what anything any of us expected, but it certainly wasn’t as tragic as the macarons. Back to the macarons: All of the flavors we tried seemed promising. A couple of them were great. As I said earlier, I enjoyed the Bananas Foster, even if my banana-hating friends didn’t (but everyone agreed it was the perfect texture). Peaches and Cream was my favorite, flavor-wise. It was summer-like, with a fruity, almond meal meringue and a creamy filling. But, it was terribly gummy. And so was the Brown Butter Pecan macaron, which had a subtle, but discernible flavor. 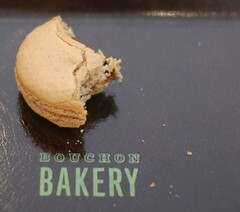 I don’t expect Bouchon Bakery to be perfect. But, given Mr. Keller’s penchant for perfection and demand for detail, I’m surprised and disappointed that Bouchon Bakery doesn’t perform at a higher level and more consistently. Three out of four of our macarons were clearly not baked properly, or were stale, there is no other explanation for such gumminess. The Turtle Tart would be a greedy dentist’s dream. And, that doughnut was too dry to be gourmet, or even good. It’s a shame that I’ve not yet had one memorably good experience with a Thomas Keller venture. My dinner at The French Laundry was thoroughly spotty and my meal at per se, upstairs of Bouchon Bakery in the Time Warner Center, was unexciting, to say the least. Too many people have praised Keller for me not to believe that he is truly talented and can produce a mind-blowing culinary experience. Hopefully – maybe – one of these days I’ll be able to experience a sliver of the genius for which he is so frequently celebrated. ~ by ulterior epicure on May 16, 2008. 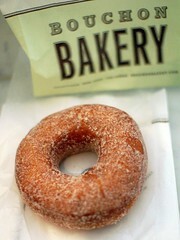 That Bouchon kiosk is one of my favorite NYC stops! I love to grab a latte and an eclair or some other pastry there and head across the street to the park! I’ve eaten at Bouchon and been to the Bouchon bakery mall Kiosk in the Venetian Hotel in Las Vegas but I really think the pastries at the Bouchon kiosk in TW are better than at the other two Keller spots I’ve hit. Dana, you don’t know how much I wish I could agree with you! 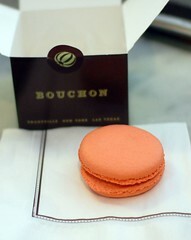 I haven’t been to the Bouchon Bakery (kiosk) in Las Vegas. Nor, have I been to either of the Bouchon’s (Las Vegas and Napa). Thanks for dropping by! What are you talking about? Bouchon’s macarons are incredible. I grab a few every time I pass by (which is quite often). You, sir, don’t seem to enjoy anything. You snubbed a dinner at Per Se! What kind of person snubs dinner at Per Se? You clearly take things for granted. And for every one of me, there’s certainly one of you. That’s how restaurants stay in business. I’m glad you enjoyed the macarons at Bouchon. I have not. As for “snubbing” per se, you may disagree with me about my experience at per se. But you were not with me at that meal. I take it you’ve enjoyed your experiences much more than I. I’m glad to hear it (sincerely). You are certainly not alone. the sign you have in your store, G. Giusti, with prices for a menu?? Could i buy this? I am from Illinois and my dad’s name is Gerald Giusti.